clovember 1-9 - Laughs! Thrills! Pathos! Over the years I have developed something of an obsession with bird print, a weakness which has gladdened the heart of many a retailer. 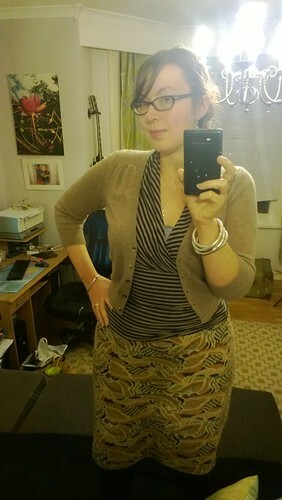 The long black pencil skirt is from M&S purchased years ago and still holding strong as The Best Skirt Ever. And a knottable necklace is doing double-duty as a bracelet. 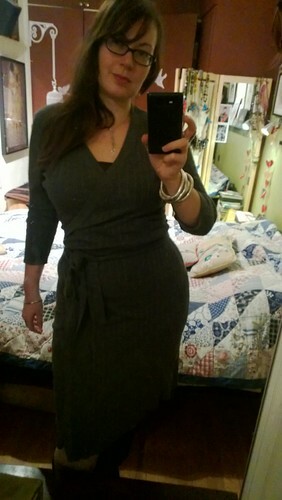 Lovely grey Phase Eight sweater-dress, via eBay. So soft and warm it's like wearing a kitten. I forgot to take a picture on November 3rd on account of running around Chessington all day, but it is essentially the same getup as below, except with one of my many grey sweaters. 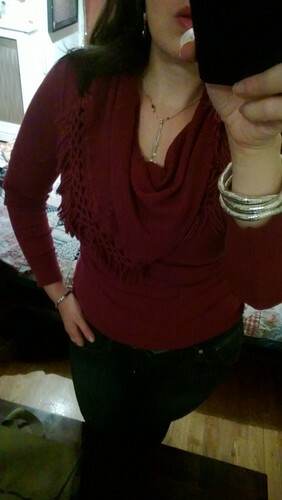 Gap Curvy jeans and berry cowl-neck sweater. More comfort clo's to help get me through a day of team meetings. Today's clo's were assembled in the dark. Shoutout to Boden cropped cashmere cardigan (sourced at 70% off in their ebay store) which I wear solidly from November until May. 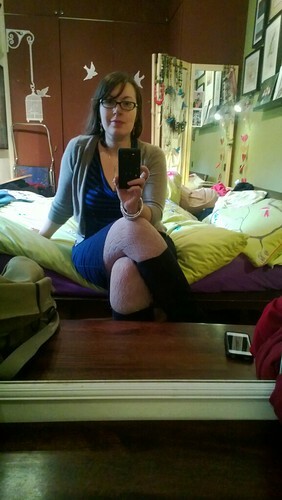 Denim pencil skirt, stripy Mango cowlneck that is older than my marriage, M&S tights and navy boots from Next that are up to the challenge of wide calves. Orange bird dress of joy and optimism. 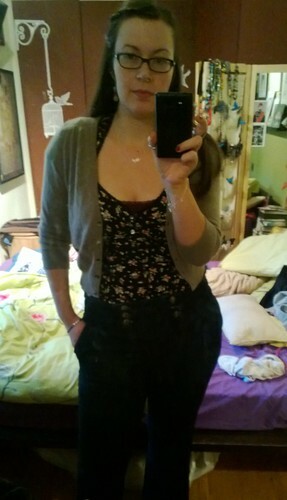 Awesomely comfortable wide-leg jeans and a cleavage-tastic top from Dorothy Perkins. Clothes have become a secret joy over the years and it has felt nice to branch out from the somewhat oppressive clothing-opinions I grew up with. 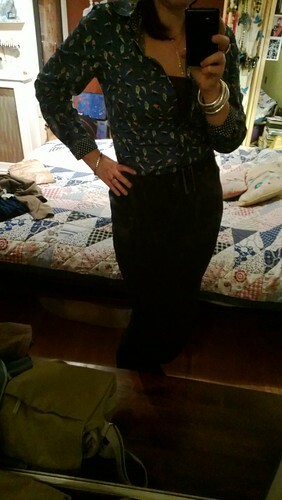 I have been loving your Clovember posts - the pink jeans are awesome. Bird print! 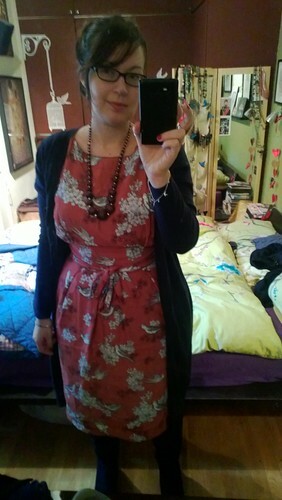 I am a recent convert, I bought a dress in a charidee shop recently which is originally Wallis and has such a gorgeous bird print on it that now I am keeping a constant eye out for more. I think the culmination of my Bird Love will one day be a bird tattoo, but I am still thinking about various designs. The dress sounds like an excellent find - what colour is it? Ah, bone of contention there! I say it is vey dark grey, Ojo says its black that has seriously faded. Bu what does he know?! The birds appear to be herons. Argh I love ALL of these pics! Where is the orange dress from? Thank you! Orange bird dress is from some random internet catalog place (isme maybe? freemans? )They tend to have a lot of strange stuff but always some nice and relatively cheap things too if you can be bothered to slog through pages of frump and satin. Beautiful outfits, well worn. Your hair has really grown! My hair has not been this long in years, I think thanks to the current absence in my life of babies obsessed with grabbing it. Orange birdie dress of joy and optimism! So lovely! I think I have too many clothes but I do enjoy them. I love the last two pics (I love them all, but especially the last two). When I make my millions I'm gonna hire you to pick out my wardrobe and decorate my house. I love it all! 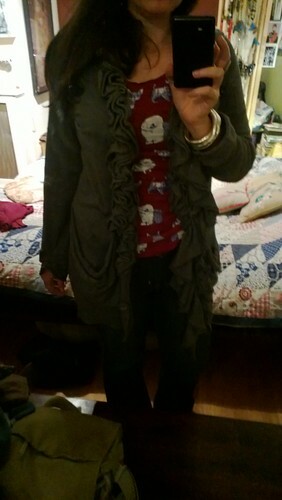 I'm a terrible decorator I think (unless you share my magpie affinities), but I do love clothes.